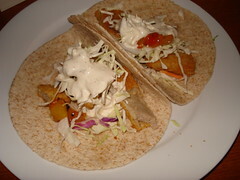 Fish Tacos | Mmm, Tasty! What’s that, you’ve never had a fish taco? Fish tacos aren’t exactly a common food here in Ottawa, but they are tasty! This version of a taco originated in Southern California, or perhaps Mexico; like many foods, this one seems to have had multiple origins! This in turn means there are a variety of recipes out there for the ‘one true fish taco’. I can’t speak for how authentic these are, but I can tell you we enjoyed them enough to have them two times in the same week. The only thing you’re really making here is the sauce; everything else is pre-prepared or store bought. Of course, if you want to get adventurous, you could batter your own fish and use that in your tacos. But for a quick and lazy meal, using fish from a box works just fine. Mix together the yogurt and mayonnaise. Add in remaining ingredients and stir well to combine. Mixture should be slightly runny. To assemble tacos: place single piece of battered fish on the centre of a tortilla (if your fish pieces are fairly large, you may want to cut them into smaller chunks). Top with cabbage, salsa, and sauce. Fold over and eat!